The unit has been designed to give students a good understanding of fuel cells technology. 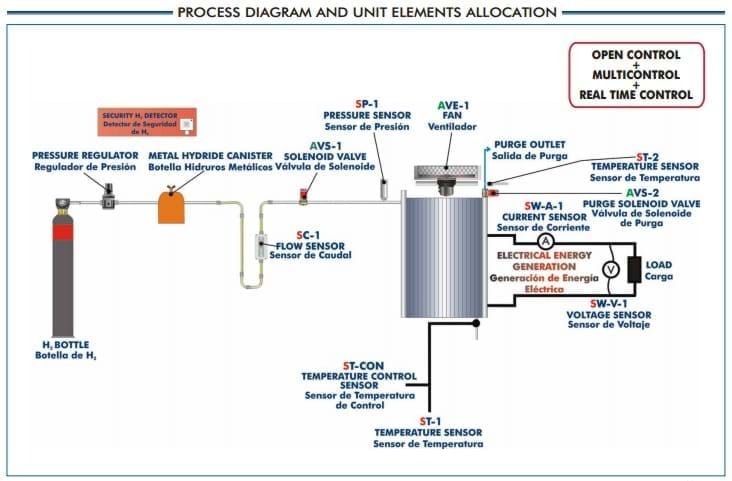 This unit demonstrates a PEM Fuel Cell, generating electrical power from hydrogen. 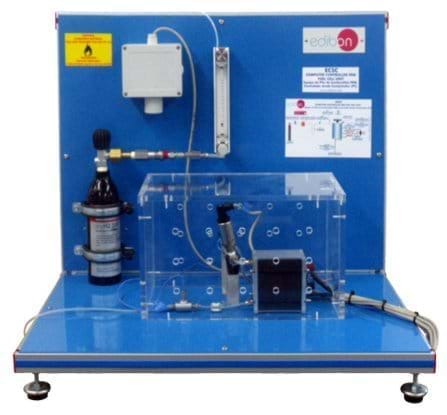 The “EC5C” unit is supplied with a stack of proton exchange membrane fuel cell (PEM) with a rated power of 100W. The stack is composed of 24 cells with the shape of channelled plates that allow the air flow through the membrane. The membrane facilitates the hydrogen flow, generating the electrons release. There are separating plates which conduct electricity, allowing thus such electrons flow, between each pair of cells. Cells are self-humidifying and do not require any type of external humidification. The stack has an integrated fan able to provide the required air for the good operation and maintenance of the appropriate temperature. Hydrogen storage represents one of the essential points regarding the hydrogen economy. For that purpose, a bottle of metal hydride (300NL) is included. Thanks to the absorption of the hydrogen inside, hydrogen is stored in a safe and certified way. Since the discharge pressure of the metal hydride bottle is 15-20 bar, the EC5C unit also includes two pressure regulators; one of them is prepared to be installed in the H bottle in order to regulate the outlet pressure at 5-50 bar; the other is placed at the outlet of the metal hydride bottle in 2 order to regulate the inlet pressure to the stack in a range from 0.50 to 0.55 bar. The unit also includes two solenoid valves. One of them is located before the stack. It controls the hydrogen inlet and when the unit is switched off, the valve is closed to avoid any possible hydrogen leakage. The other valve is placed at the stack outlet. It purges the excess of water and hydrogen towards the exterior for a correct operation. The unit has a load regulation system. It enables the study of the generated electrical energy, the representation of the characteristic operation curves and their comparison with the theoretical curves. It includes a variable power rheostat, which enables to vary the generated power. The whole electrical circuit of the stack is protected by a short circuit unit in case of an over current (12A) and low voltage shut down (12V).It includes a hydrogen leak detector with a detection range from 0 to 2% Vol. and from 0 to 100% LFL respectively. self-humidifying and do not require any type of external humidification. Integrated fan in the stack. hydride and outlet range from 0.50 to 0.55 bar. Load module: Rheostat: 33R 315W. Hydrogen leakage detector (4-20 mA; IP65), and software warning. Failure protection with solenoid valve at the stack inlet. Over temperature shut down in the stack. Control temperature sensor placed between two bipolar plates of the cell. Temperature sensor for the purge flow. Current, voltage and power sensors.